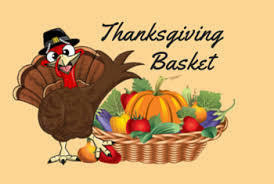 The students of the Gardiner Area High School Chapter of the National Honor Society are sponsoring their annual Thanksgiving Basket food drive from now until November 19th. Our goal is to provide 175 families in the RSU 11 communities with a turkey and various non-perishable food items sufficient to feed them over the Thanksgiving holiday break. We need your help! If you are able to provide a frozen turkey (or two, or more...), we will be collecting them here at the high school on Friday, November 16 and Monday, November 19th. Due to a severe shortage of storage space, we would be most grateful if you could A) let us know you if you plan to bring a turkey, and B) drop off your turkey on Monday the 19th, any time between 7 AM and 2 PM. (We would still be happy to accept turkeys on Friday the 16th if you don't have freezer space at home.). Non-perishable items such as peanut butter, jelly, coffee, canned veggies, and stuffing mix can be dropped off any time between now and the 16th. Many thanks for your consideration and generosity!